Today, I went out to shoot some dinosaurs for my forthcoming book, Photo Fun. In the book, I have a chapter about photographing monsters. The chapter is shaping up quite nicely. There is only one section left to write, about what to do if you live in a monster deprived environment. The solution is quite simple: Go to a toy store, or raid your children's toy collection, and grab the most realistic looking toy monsters you can get hold of. My son, Tim, has an interesting collection of creatures from the dawn of time and the farthest reaches of space. Finding monsters to shoot is not a problem. Most of the chapter in the book is about finding and shooting full scale monsters, but for toy creatures, a macro lens is the way to go. I used a Canon 60D DSLR with a Tamron 60mm 2.0 lens. Most pocket cameras will have a macro mode that is quite sufficient. A camera phone will also do in a pinch. When shooting toys, background and lighting will make or break your photos. I went to a park and found some ferns and low bushes I could use as background, and set up the dinosaurs. I used a remote controlled flash with a CTO gel to warm the light, and a speed grid to shape the light into a tight beam. I wanted the dinosaurs to be lit, and the background to be as dark as possible. Before shooting, I set my camera to manual, 1/250s, f18. I took a test shot, which was all black. This meant I had eliminated ambient light. I then took a few test shots, with flash, and adjusted my camera settings until the pictures came out the way I wanted them. 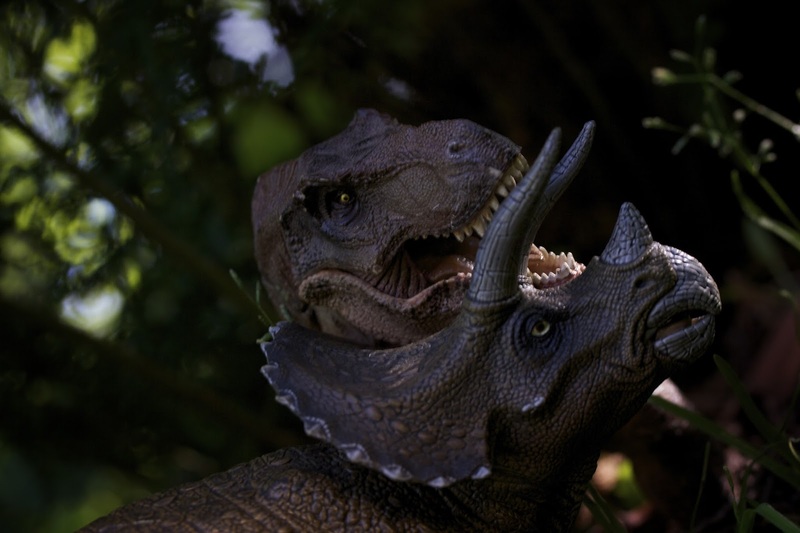 In the shot above, both dinosaurs look a bit plastic. This is because I shot them on the side lit by the flash. You have the same phenomenon in portrait photography. Most of the time, you should avoid shooting the side of a face, or monster, that is lit by the flash. This picture looks more realistic. You can see how the flash lights the side of the dinosaurs opposite from the side I photographed. You will need to experiment with shutter time and aperture to control ambient light. If you use a speed grid on your flash, you have to aim it very carefully. It is easy to miss the models altogether. 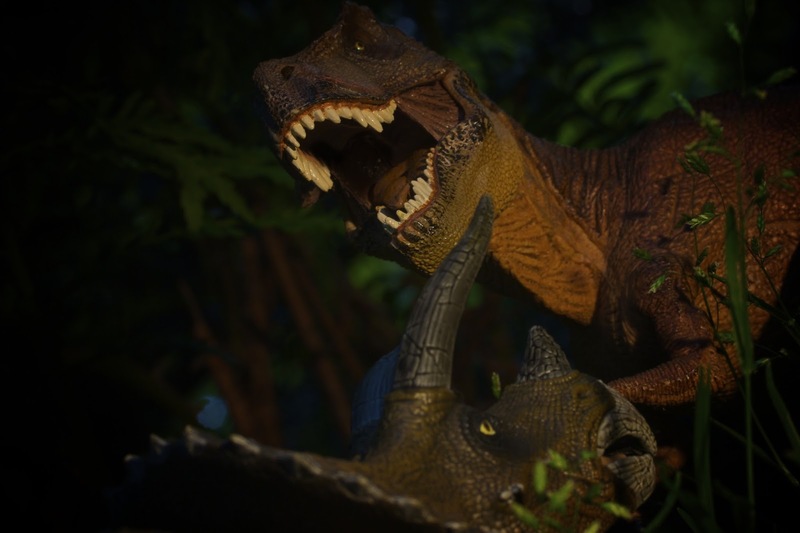 I won't go into details about post processing in this post, except one thing: On dinosaur models like these, the nostrils are dead giveaways. They are not deep enough to look realistic. Because of this, I have shaded them with Aperture's Burn tool. You can do the same thing in Adobe Lightroom, or whatever program you use to post process your images. Finally, if you do something like this, bring your children in on it if they are interested. After all, it's their toys. 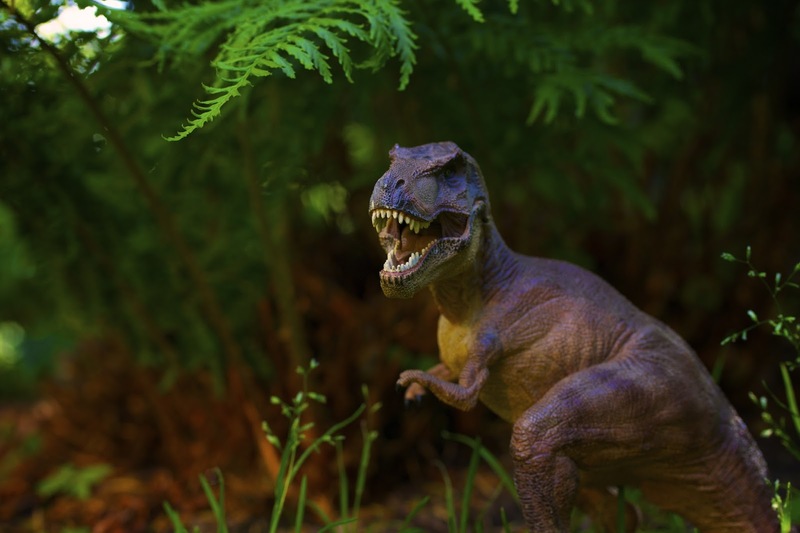 If you liked this tutorial, you may also enjoy my tutorial about photographing full size animatronic dinosaurs.